Former Catalan president Carles Puigdemont said Thursday that he, together with five other pro-independence leaders being held on rebellion charges in Spain, have filed a UN complaint against Madrid for rights violations. ‘We are denouncing a serious violation of rights and freedoms in Spain, which is unacceptable under the European Union rule of law,’ Puigdemont told reporters in Geneva, sitting alongside lawyer Nico Krisch and other members of the Catalan community. His five co-plaintiffs, including Jordi Sànchez, the former head of the influential grassroots Catalan National Assembly (ANC) independence movement, and Jordi Turull, a former minister in the Catalan regional government, are meanwhile all behind bars in Spain awaiting trial over their roles in Catalonia’s failed bid to secede from Spain last year. Thursday’s announcement came as several of the plaintiffs ended a weeks-long hunger strike, launched to protest alleged unfair treatment by Spain’s justice system. Puigdemont stressed that the complaint was being brought by six people who had been ‘democratically elected and who have not been convicted’ of anything. ‘Five of them (have been) in pre-trial detention for more than a year, (and) can not exercise their rights,’ he said. 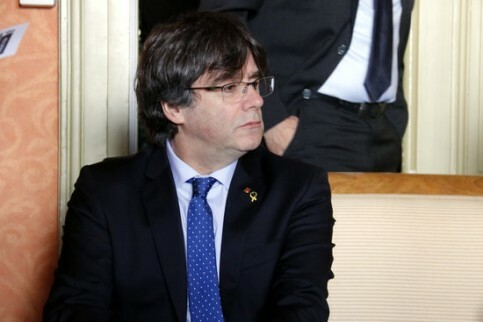 Puigdemont, who settled in Belgium late last year, has also been accused of rebellion by the Spanish judiciary but Madrid withdrew the international arrest warrant it had issued for him last July. The complaint filed with the United Nations Human Rights Committee on Tuesday was a ‘key step’ in raising international awareness about the violations and bringing them to an end, he said. Last March, Puigdemont and Jordi Sànchez filed a separate complaint with the UN over being blocked from running to serve as Catalan president but the UN has yet to reach a decision in that matter, Krisch said. Nine Catalan pro-independence leaders in all are in pre-trial detention awaiting trial before the Supreme Court of Madrid. Spanish Prime Minister Pedro Sánchez is meanwhile set to hold a cabinet meeting in Barcelona on Friday amid tight security as Catalan pro-independence groups plan to hold protests and block roads in the region. The meeting comes a year to the day after Madrid held snap elections in Catalonia after blocking the wealthy northeastern region’s move for independence. Many pro-indendepence supporters have called the timing of the meeting ‘a provocation’. Puigdemont stressed Thursday that the separatists had no plans to resort to violence. ‘From the beginning of this process, we have expressed ourselves clearly and without ambiguity to say that never, never will violence be an option for us,’ he said.